Naval efforts to protect endangered whales by gradually increasing the noise levels of sonar have limited benefit, researchers at the University of St Andrews have found. The process of slowly raising the noise level of sonar – known as "ramp-up" – was adopted by several European navies, and geophysical explorers who use airguns to search for oil and gas reserves, as a method to reduce the harmful impact of very loud sounds produced by humans in the sea. Many scientists fear human-generated noise in the oceans could damage the hearing of these sensitive creatures. It was hoped that "ramping-up" would encourage the animals to move away calmly before the sound reaches full volume. However, it was not known how effective these warning strategies were, until an international team of researchers led by Dr Paul Wensveen and Professor Patrick Miller of the Sea Mammal Research Unit (SMRU) at the University of St Andrews recorded the responses of 13 humpback whales to sonar in the Barents Sea north off Norway. After attaching data logging tags, which record sound and movement, to individual whales via suction cups, the team then reproduced the riskiest situation for whales at sea: when a navy vessel sails towards the mammals towing a transmitting sonar source. The team analysed the response of whales as they gradually increased the sonar to full intensity. 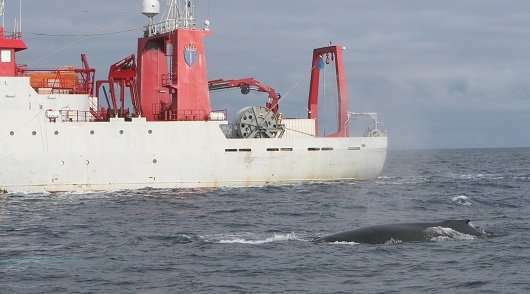 The research, published in the Journal of Experimental Biology, found that while evasive action did reduce the chances of whales encountering damaging levels of sound, only five of the 11 animals veered away from the ship on the first occasion "ramp-up" sounds were transmitted, so overall sound levels received by humpbacks were only reduced by a few decibels. However, the study indicates that hearing of those most responsive animals would be more effectively protected by the "ramp-up" procedure. Animals that had responded when the sonar first sailed towards them were more reluctant to veer away from the gradually increasing sound on the second occasion that the team tested their reactions: though a mother and her calf veered away a second time. The results are consistent with an earlier study with humpbacks off Australia, by Dunlop and co-authors, that didn't strongly avoid increasing levels of airgun noise. Professor Patrick Miller said: "Our research suggests that humpback whales may be reluctant to avoid sonar if they have heard it before, or are distracted by food. "Unfortunately, seemingly common-sense measures like 'ramp-up' may not be as effective as we hoped for protecting hearing of whales from loud sounds like sonar. However, there was no indication in our study that 'ramp-up' increases risk to hearing, and that 'ramp-up' may be effective with those species or individuals that are more sensitive to sound disruption and therefore move away more strongly."